The ultimate in the vintage clothing collecting realm lies in Hollywood costuming. This is especially true when it comes to the truly iconic dresses and gowns worn in Gone with the Wind, a film based on the novel by Margaret Mitchell. As the heroine of the film, Scarlet O’Hara, portrayed by Vivien Leigh, wears some of the most memorable costumes in movie history. This includes the infamous Curtain Dress shown in the scene above, which was later spoofed by Carol Burnett in her classic “Went with the Wind” skit in the 1970s. The green Curtain Dress was one of three original and two replica gowns from the movie displayed as part of “The Making of the Gone with the Wind” exhibit from Sept. 9, 2014 through Jan. 4, 2015 at the Harry Ransom Center on the University of Texas campus in Austin, Texas. These dresses, designed by Walter Plunkett, are part of the David O. Selznick archive received by the Ransom Center in the 1980s. They had not been displayed together for more than 25 years prior to this exhibit coinciding with the 75th anniversary of the release of Gone with the Wind. In 2010, the Ransom Center raised more than $30,000 from donors around the world to support conservation work required to safely display the gowns in the 2014 exhibition. Prior to the collection's arrival at the Ransom Center in the 1980s, the costumes had been exhibited extensively for promotional purposes in the years after the film's production, and as a result were in fragile condition. - the Harry Ransom Center’s website. Now that the dresses have been restored properly and custom mannequins on which to display them have been crafted, they can be loaned to other museums and enjoyed by the public once again. 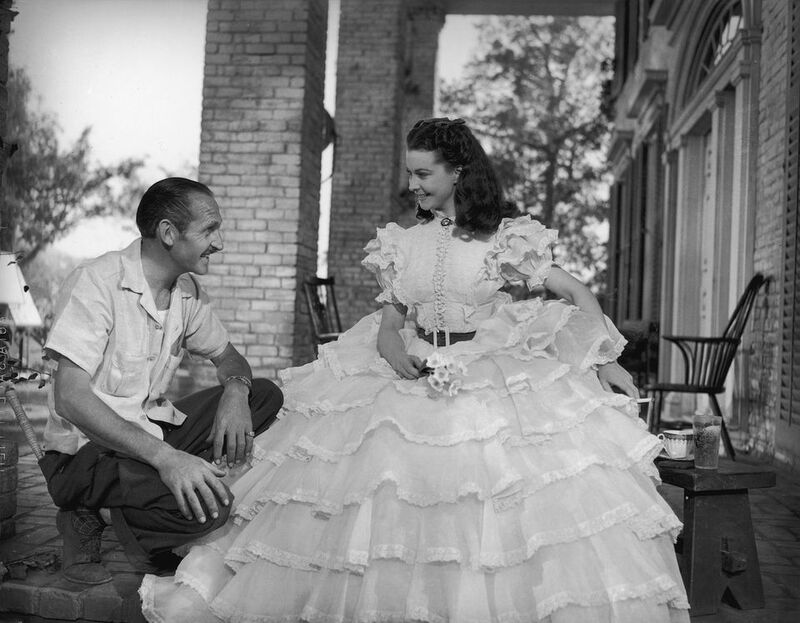 The green Curtain Dress, or Drapery Dress, designed by Walter Plunkett is likely the most remembered and revered of the Gone with the Wind costumes. In the film, after making her way back to her beloved Tara, not much was left in the war-ravaged mansion other than her mother’s green drapes. 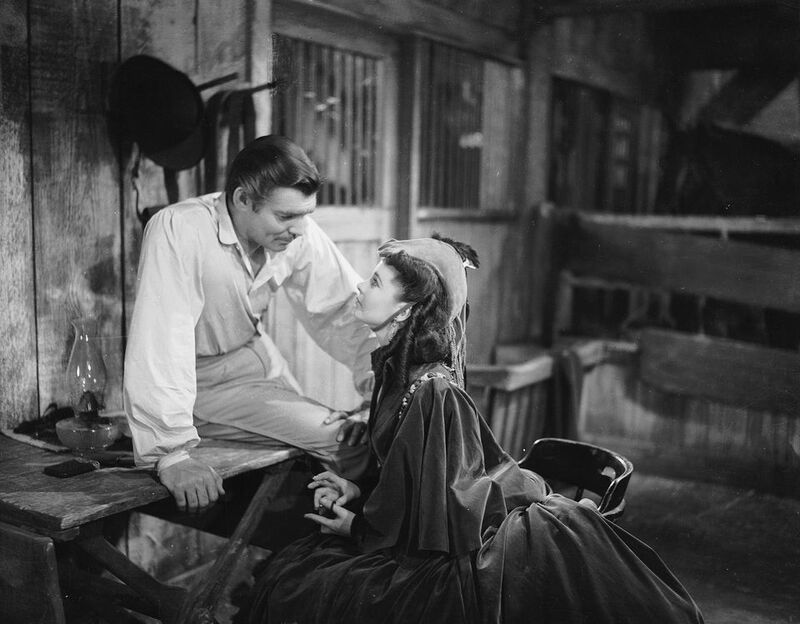 As she schemed for a way to approach Rhett Butler, played by Clark Gable, for the assistance of the financial variety, Scarlett removed the drapes from the wall and demanded that Mammy sew a dress from the fabric and trim. It is, in effect, a symbol of Scarlett's will to fulfill her promise never to go hungry again as made in the memorable “As God is my witness …” scene prior to the film’s intermission. The dress was later spoofed by comedienne Carol Burnett in her classic “Went with the Wind” skit in the 1970s. The parody was so well-received by audiences that the replica dress, complete with a curtain rod across the shoulders, is now a museum piece itself. In 2010, the Harry Ransom Center raised more than $30,000 to support conservation work on this dress along with the others featured in this slideshow. They were displayed in the 2014 exhibition “The Making of Gone with the Wind” at the Ransom Center on the University of Texas campus. The burgundy ball gown is perhaps the most elegant and dramatic of all the Gone with the Wind costumes. It is described as a “sleeveless, silk velvet gown is embellished with glass teardrop beads and round, red faceted beads at the neckline and a profusion of ostrich feathers around the shoulders,” by the Harry Ransom Center on The University of Texas campus where it resides as part of the David O. Selznik archives. More than $30,000 was raised in 2010 by the Harry Ransom Center so this dress along with several others could be conserved appropriately. They were displayed in the 2014 exhibition “The Making of Gone with the Wind” at the Ransom Center on the University of Texas campus. The dress is made of red-burgundy silk velvet with a profusion of matching ostrich plumes, even on the back of the elaborate train. Go back to the previous slide to see a color photograph of the dress on display as part of “The Making of Gone with the Wind” exhibit at the Harry Ransom Center. This elaborate dressing gown designed by Walter Plunkett combines stylish Hollywood glamour with medieval elements. It is made of silk velvet and heavily embroidered in gold to the signify wealth and social standing Scarlett achieved as the wife of Rhett Butler. It seems to echo the colors in the Drapery Dress thrown together on a whim to show how far Scarlett had come since she was forced to grovel for money after the war. Realizing her waist had grown to the unfathomable measurement of twenty inches after giving birth to her daughter, Scarlett declares to Mammy that she won’t have any more children and dons this elaborate dressing gown. Rhett visits her in her room when she decides to stay in for the evening, as shown in this still from the film. The Technicolor shade of the dress is perhaps much more vivid than the original fabric, but the silk velvet used to construct the wrapper has decidedly faded over the years. Return to the previous slide to see it on display in the 2014 exhibit “The Making of Gone with the Wind” at the Harry Ransom Center on the University of Texas Campus. This deep blue velvet robe with black fox trim is one of the two replica gowns that were displayed as part of the 2014 exhibit “The Making of Gone with the Wind” at the Harry Ransom Center on the University of Texas Campus. It was made in 1986 by Carrie Harrell and Jan Hevenor based on Walter Plunkett’s original design worn in the 1939 film, according to information provided in the exhibit. This bridal gown made of ivory silk satin with appliqué leave and vine design is one of two replica gowns that were displayed as part of the 2014 exhibit “The Making of Gone with the Wind” at the Harry Ransom Center on the University of Texas Campus. It was made in 1986 by Carrie Harrell and Jan Hevenor based on Walter Plunkett’s original design worn in the 1939 film, according to information provided in the exhibit. The conniving Scarlett quickly married Charles Hamilton before he marched off to war so there was no time to have a proper wedding gown made. Thusly, she wore her mother’s gown which was in a style clearly out of fashion for the Civil War era wedding. To make the scene more realistic, Walter Plunkett fitted the gown on a dress form normally used for Ellen O’Hara’s costumes. The result was a dress that was obviously too large for Scarlett’s small frame to fit the scenario perfectly.